After a thirty-year hiatus, the vacuum coffee maker is making a comeback in the world of coffee. Its unique extraction process highlights the subtlety of the flavours, resulting in a light, infusion-like coffee. A must-try if you want to see coffee in a new light. 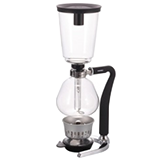 The most popular brands are available on MaxiCoffee : Hario, Bodum and many more! 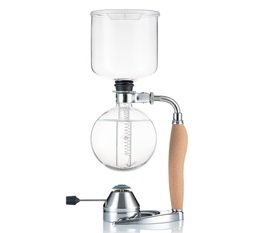 A set including the famous Bodum Pebo vacuum coffee maker and a gas burner especially designed for this syphon coffee maker. The Bodum gas burner allows you to heat your Bodum Pebo vacuum coffee maker (or syphon coffee maker) while keeping it securely in place. A pack of 5 spare cloth filters for Hario TCA vacuum coffee maker. These spare cloth filters mean you can make an excellent cup of coffee whenever you want. This handle is suitable for type C and D Cona coffee makers. Spare glass upper beaker for Bodum 11744 E-Pebo electric vacuum coffee maker. 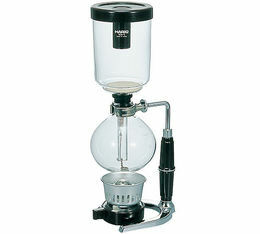 Bottom glass jug for the Bodum Pebo vacuum coffee maker. Upper glass beaker for the Bodum Pebo vacuum coffee maker.